while i was gone. — Brandon Denzil. When I created this website in 2014 I was fresh out of college, a couple months into a new job, and my love of photography was starting to take shape. Leading up to that point I went through several stages: lurking the photography section of the hypebeast.com forums in high school and drooling over stylized shots of stuff I could never then afford...creating the standard-issue instragram with the heavily filtered photos of food (shout-out to chronological feeds)...saving up to purchase my first dslr and creating a flickr for use as a dump for my new infatuation with...*shudder* hdr photography. Soon after, I found myself more concerned with the stories my images told and started gravitating towards street photography. It was around this time I decided to create my own personal portfolio where my work would live. I earned my first paid gigs, experimented with new ideas, and connected with great people I would have never otherwise had an opportunity to encounter. In the fall of 2015, my mother got sick. There were several very close calls and being her only child I was forced to grow up very, very quickly. I was under financial pressure, personal relationships became strained, and my photography was put on hold. The next 2-3 years were a bit of a blur; people’s positions and roles in my life changed. I felt as if I had no control over what was happening and it was hard coming to terms with that. But in the summer of 2017, I reconnected with a pair of friends who shared my appreciation for photography. We spent weeks running through the boroughs of new york, collaborated with other creatives, and I even got my work officially published. But despite all everything, life still happens. In the fall of 2017, a friend passed away in a tragic accident. He was also a creative; a skilled painter with a good heart and an army of people who loved him dearly. I have never been good at processing death. But what I took from his passing was what he left behind. His work became more than his hobby or his passion; it became a tether for his memory. One that his loved ones will use to cope and remember. For those who never had the honor of meeting him to interpret and appreciate. I have never printed my own work. In this age we consume everything via the tiny screens in our hands; a glance and a double-tap, then we keep scrolling. But this year, that changes. 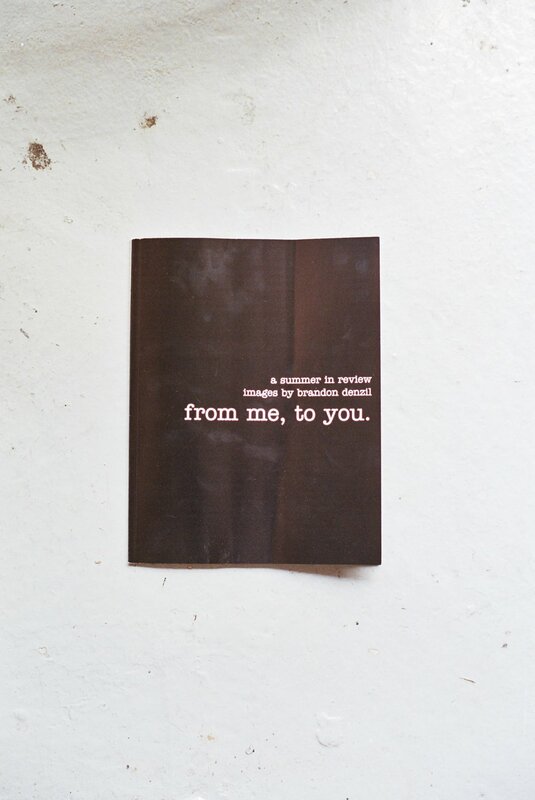 Today I release my first collection of printed work, "from me to you", documenting the summer where I started to find myself and took my first steps towards leaving something behind for my loved ones. It is available for purchase below. Hopefully you can share that first step with me. Cover for "from me, to you". It is 8.5×11in and 48-pages, printed on 80# Matte text (118 GSM) paper, with a 80# Semi-gloss (216 GSM) front and back cover. Click the image to be taken to the purchase page.